The future is exciting yet daunting. Although we now have more space in the extended print-shop to increase production of The Word For Today, we must urgently raise money for a new roof for the original building, which has started to leak. We must also replace the vehicle that is used for delivering The Word for Today throughout Romania, since it is too small for our requirements. We are also looking into the possibility of acquiring an additional press to keep up with the ever-increasing demand for the publication of The Word for Today - both in Romanian and Hungarian languages. Alex using the new ramp to bring paper into the newly constructed print room. 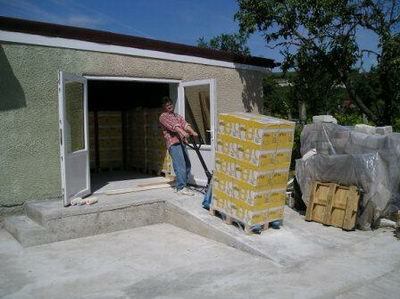 The whole courtyard has now been concreted, with the ramp allowing easy access for the truck. 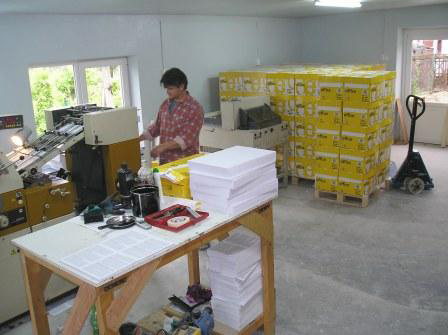 The new print room showing the vastly improved working conditions, and valuable space for extra production of The Word For Today. Ralph and Alex with room to move at last! Praise the Lord! 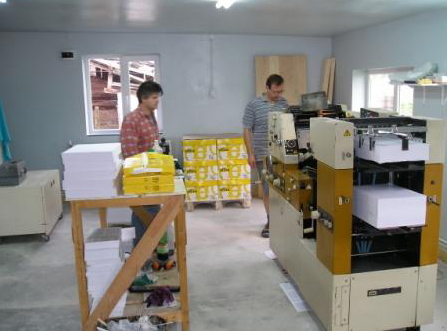 The four photographs below show the arrival and unloading of a replacement, more efficient booklet-maker from England. Your browser does not support inline frames. Click here for Information.